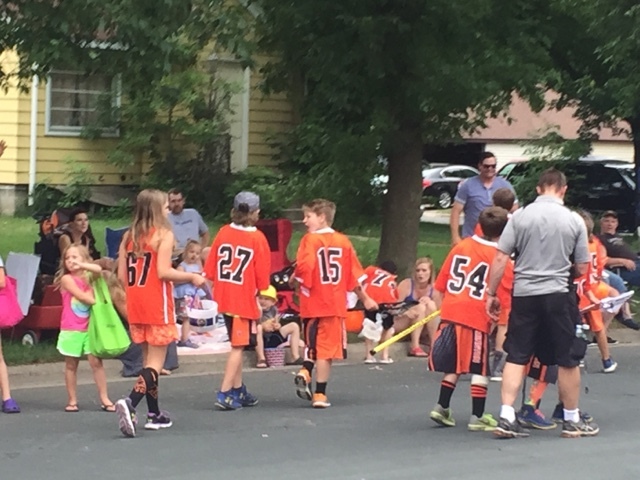 Landen's lacrosse team marches in the Farmington Dew Days Grand Parade. Held at the Dakota County Fairgrounds, Dew Days celebrates summer with a few fun-filled days of such attractions like carnival rides, fair food, a beer tent, motocross races and even outdoor movie showings. Fair queens are crowned, and the small suburb seems to fully enjoy themselves. Our major draw, of course, is the parade. 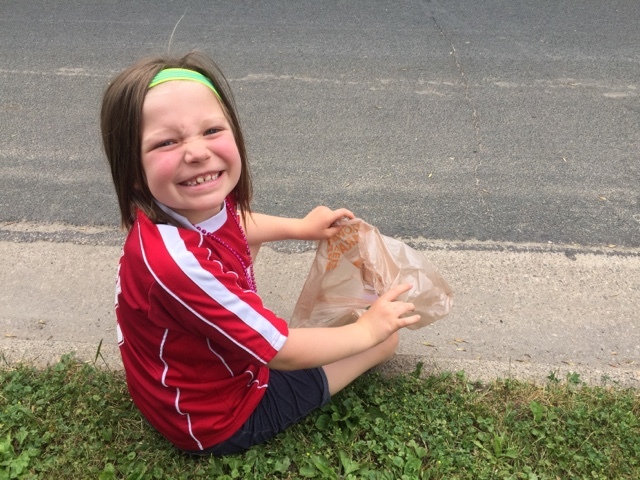 This year, we had prime real estate near the start of the parade route and Madelyn came prepared with a bag for candy collection. And boy did she score. Since many of the parade participants are the city's youth sports leagues, the young parade walkers don't manage their supply well. Though the parade route isn't that long, much of the candy runs out towards the end. Madelyn managed to collect so much candy and parade swag that the bag ripped, and the largest bowl I own overflows with her bounty. Nick managed to score a drink koozy in the shape of a cowboy boot, officially the coolest in his collection. Since Landen (#27) walked, he appreciated Madelyn's diligence in her supporting role as Candy Collector. I've let him pack a couple of pieces into his lunch box before he spends the day at summer camp. Here's what I found smart about this event - the start time is in the early evening hours. In Minnesota, summer time means the skies are still light come 9:30 p.m. With a 5 p.m. start, the sting of the sun has diminished, granting parade watchers a more comfortable experience. It was also a little overcast this particular evening, so the parade was quite enjoyable. The 2017 Farmington Dew Days Grand Parade was held a few days after our move, and I have to admit - I feel like we've crossed into enemy lines. Farmington is such a charming city, and one of the smaller suburbs of the metro, which makes it incredibly community-oriented and close-knit. Though a few of the local businesses and leaders have places in the parade, it's cool to celebrate the young athletes and children too.